The movie Silent Epidemic: The Untold Story of Vaccines presents arguments against vaccination. One of the arguments is that the alleged benefits of vaccines are actually due to modern health and sanitation. 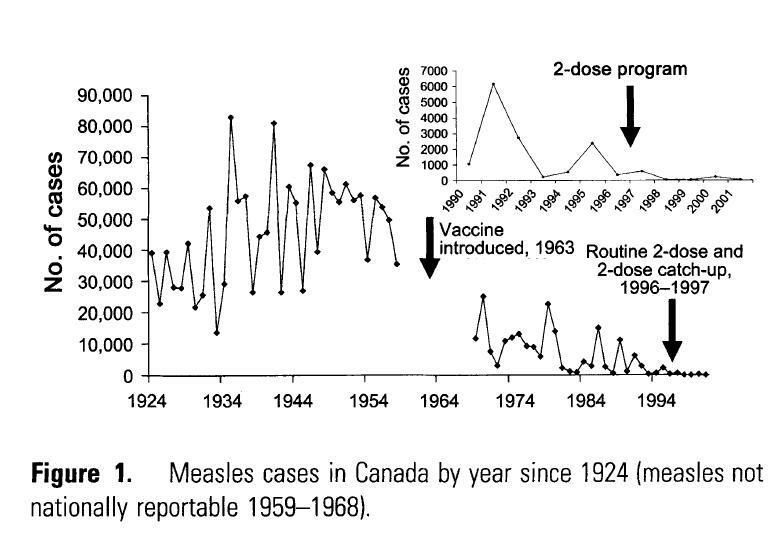 The answers essentially say that measles deaths did drop before vaccines were introduced, but overall cases did not drop dramatically until vaccination programs were widespread. I haven't seen anything related to claims that it was a broader range of infectious diseases. 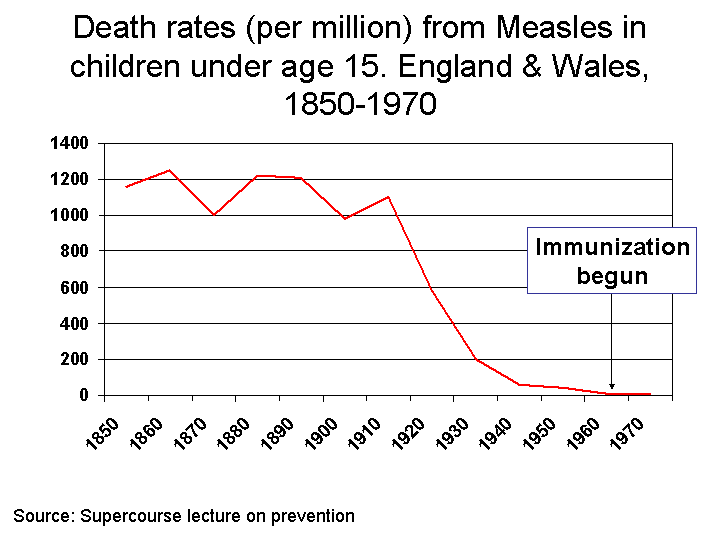 The main point of these claims is that the death rate for some diseases was declining before vaccines. While that is true, it misses the fact that even though the death rate was declining, plenty of people (mostly children) were still getting and suffering from these diseases. 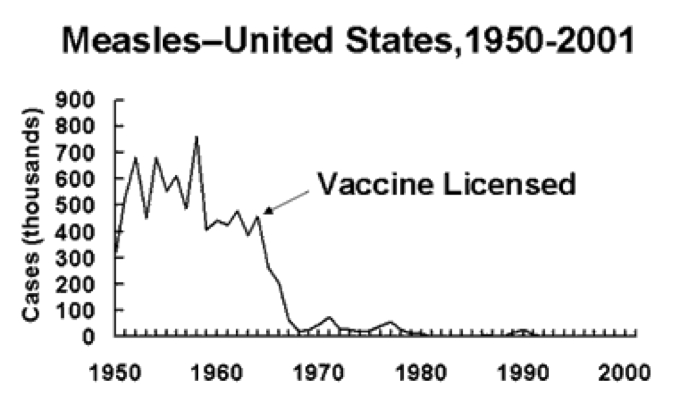 Vaccines dramatically decreased both the number of total cases and the number of total deaths. 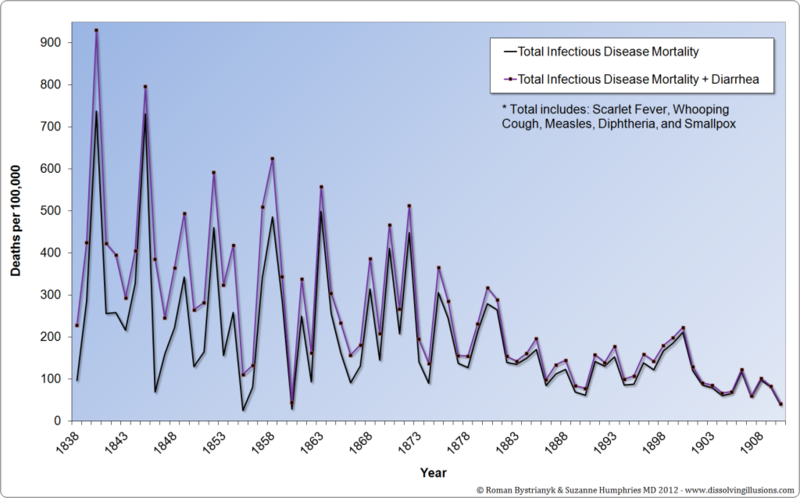 I think that Scarlet Fever (also called Scarlatina) was included in the graph because it was grouped with diphtheria until 1861. (Or maybe they're trying to trick you.) There is currently no vaccine for Scarlet Fever, so it's pretty irrelevant here. The problem with only looking at the deaths is that for many of these diseases the treatment improved and fewer people died, but they were still getting infected in the first place. I found a paper that lists some 19th century disease statistics. The data is not as granular as in the graph, nor does it all go back as far as 1838 (and some of the stats cover the gap seen in the graph), but the data that is there matches up with the 19th century part of the graph well. The full paper also lists stats for Scarlet Fever and Smallpox. It was classified with scarlet fever until 1861; and because of the uncertainty of diagnosis, any conclusions about it must be speculative. An antitoxin was discovered in 1894, but, as with all early antitoxins, it had to be administered within the first four days of infection, which is when symptoms are the least evident. 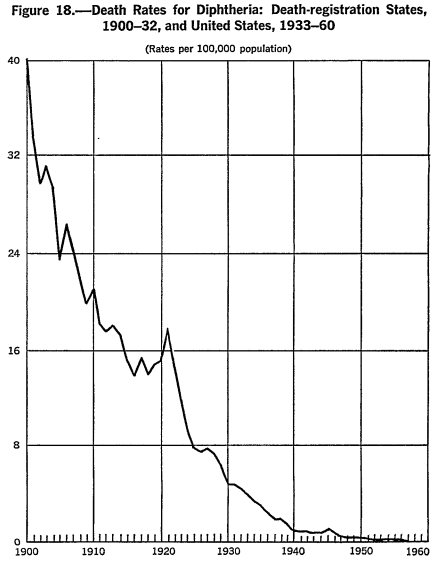 However, the mortality did decline from 9 446 deaths in 1894 to 7 661 in 1898. This fall probably relates to the wealthier classes, since the antitoxin was expensive, and not distributed free. It was 1913 before there was an effective diphtheria prophylactic and 1923, before the first safe vaccine was produced. You may need to use Archive.org to view some of the sources, like this one. 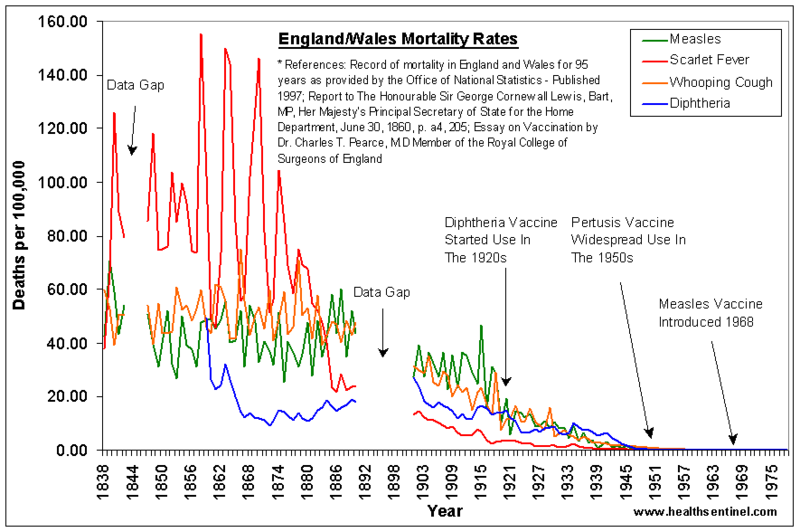 These data are taken from Roush and Murphy (2007) – Historical comparisons of morbidity and mortality for vaccine-preventable diseases in the United States. In the Journal of the American Medical Association, 298, 18, 2155–2163. The same data can be viewed in a table here. 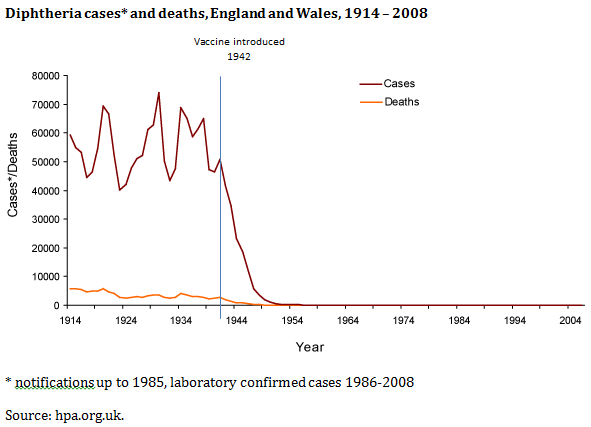 As you can see from the curve the number of cases dropped when vaccinations became available. I don't think hygiene can be the cause here. I'd like to point out that there are indeed sanitation/hygiene measures that were and are used and that did help to reduce infections with those contagious diseases even before vaccination became available. 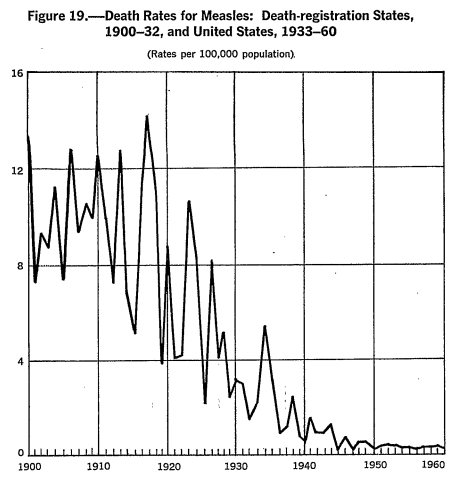 Here is an historical view of deaths due to measles. 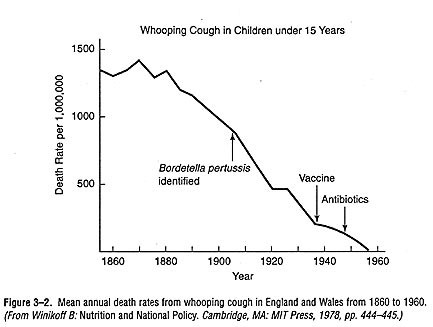 The decline after the first World War was due to public health measures (case reporting, quarantine, etc) more than immunization. The immunization came in at the very end, as a finale to the prevention story. ...is a public health/hygiene measure that is still in use, but for those infectious diseases where vaccination is available, it is mostly not necessary any more. And it is certainly neither cheap (consider that measles in the kindergarden of an unvaccinated community may mean that no family member of any kind in that kindergarden group is allowed to leave their house to go to work or even just shopping until it is clear they did not catch measles). In addition, modern lifestyle (more urban living people, lots of traveling) makes containing diseases by quarantine more difficult, particularly the ones that are highly contagious already before the patient develops clear symptoms. 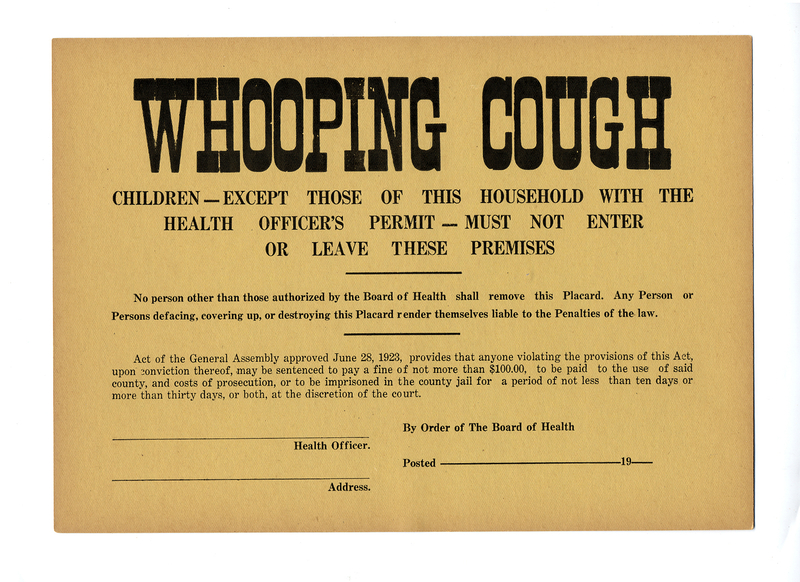 Whoever has or is supected to have whooping cough is e.g. not allowed to work (teach, care, supervise, ...) or attend community centers (that would range from kindergarden over schools to elderly care homes etc.) or group activities until a doctor says they are not contagious any more. This also means e.g. that a resident in a nursing home with whooping cough is not allowed to use the community living room, kitchen, etc. whoever has salmonellosis, is not allowed to prepare food "professionally" (from community center kitchen over restaurants to food industry). So in fact, there is a bunch of diseases where we do not rely on vaccination (and antibiotics) only, but actually a mix of different measures is taken. Not the answer you're looking for? Browse other questions tagged vaccines public-health . 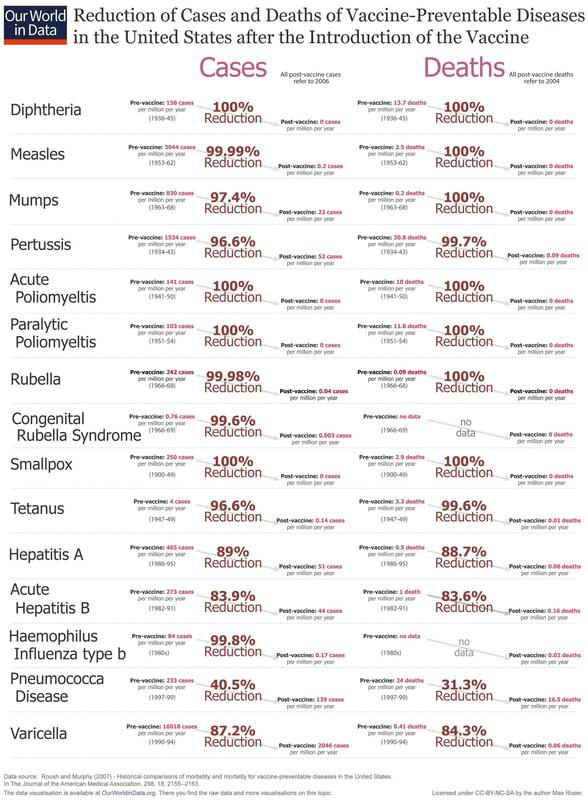 Did diseases, decrease over 90% before the introduction of vaccines?